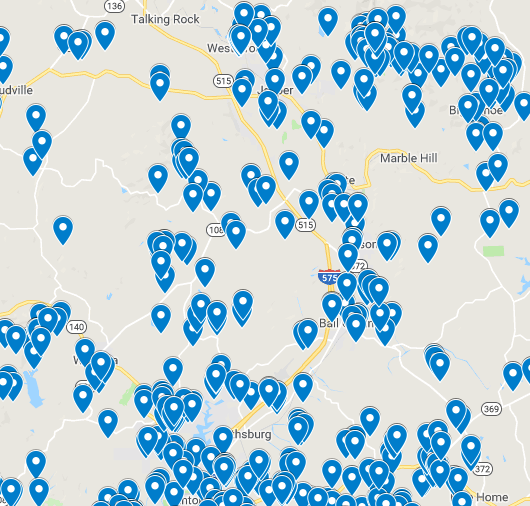 Blue pin markers represent over 250 homes in Jasper GA. Cornerstone Service Specialists (CSS) is the most highly-rated, full-service garage door repair service in Jasper, GA. From broken electric openers to multi-car garage installation, our team understands the hassles that homeowners face with garage doors. Our team is here to alleviate those frustrations, providing affordable and precise results in a matter of hours. Service: Ever run into a problem with your garage door/overhead door? CSS specializes in routine service and emergency fixes. Simply give us a call and one of our garage door repair technicians will be on-site in no time. We now service Northwest Georgia! We’ve expanded beyond the Jasper, GA area to offer you the same trusted garage door installation and repair service closer to you. Contact us if you live in Cartersville, Fairmount, Rydal, Nelson, Talking Rock, Big Canoe, Ball Ground, Adairsville, Dawsonville, Ellijay or nearby.